We’ve had a great week preparing for the Arayot chanichim (campers) to finally arrive at camp! On Sunday, the roshei ayda (unit heads) drove up and had their first few meetings. We were excited and happy to see each other after a long ten months of waiting to be back at camp and started working on creating a fantastic summer immediately. 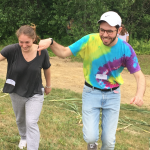 The madrichim (counselors) came early the following week and our Yavneh community began to build up. As Shabbat started and the last rays of sun dipped over Lucas Pond, the Yavneh tzevet (staff) gathered outside in Gilboa (the amphitheatre) to pray together and welcome Shabbat to camp. We had a service and dinner full of ruach (spirit) and kavana (intent), and afterwards joined together in a beautiful and meaningful tisch (song and story sharing circle). Yesterday morning we took a short but invigorating hike up Saddleback, a trail that’s particularly close to camp, and, after cooling our sweat in the light breeze at the top of the mountain, we filled our stomachs and our minds, eating breakfast together and engaging in an enlightening discussion relating prayer, the magnificence of nature, and the beauty of Machaneh (Camp) Yavneh. Soon enough, the bunks will fill with chanichim (campers) and the busy hum of the summer will settle in. Arayot is going to be a summer filled to the brim with fun; this will be the chanichim’s first summer as a singular aydah (age group), they’ll be participating in ketzev, learning dances and songs to perform at an old age home and in front of parents at Hebrew College, and practicing for zimriya (song competition). We can’t wait!